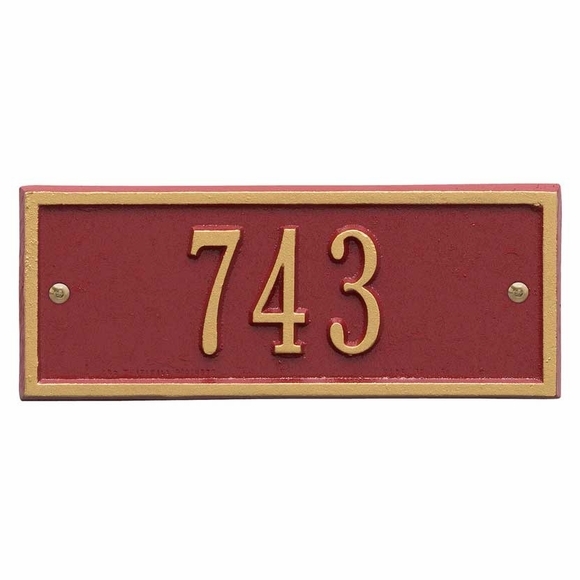 Rectangle Address Sign - - petite 8.75" x 3.5" address plaque fits on small surfaces. Wall mount. Made in USA. Holds up to five 2" characters on one line. Large image color is red/gold combination. Smaller images colors are black/white and pewter/silver. Petite size Rectangle Shape Address Sign fits on small surfaces. Wall mount. The product was very nice and well constructed. I didn\'t say excellent only because it was a lot smaller than I had hoped for and it took quite some time to receive my order.